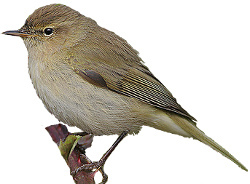 This bird has the typical dull, greyish appearance of a Chiffchaff, the dark legs and dumpy appearance confirm the birds identity. This photo also illustrates how distinctive the birds eye ring can be. Willow Warbler (left), Chiffchaff (right): Note the difference in wing lengths and wing posture, the Willow Warblers primary feathers are much longer. Note the dark legs, faint eye stripe, eye ring and dumpy appearance. 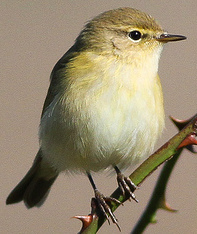 This photo clearly illustrates the Chiffchaffs round head shape. Very common and widespread summer visitor to Northern Europe and the UK but does not breed in the far North of Scotland. Frequenting scrub, hedges, orchards, and woodland. The Chiffchaff's name is derived from it's repetitive call: chiff chaff chaff chip chap chiff chep, and this is the best method of identification. 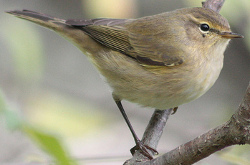 A widespread summer visitor which has become resident in the South West of England, the Chiffchaff can be seen in any area of woodland or scrub. The Chiffchaff has a distinctive downward bob of the tail which can help separate it from the very similar Willow Warbler.